There is certainly nothing boring when it comes to a trip to sunny Orlando Florida. Unfortunately, this includes driving on the busy roads with all of the impatient people who want to get to where they are going as quickly as they can possibly get there. This, coupled with all of the visitors maneuvering through unfamiliar roadways is nothing more than a recipe for disaster. There are accidents galore, especially in downtown and the tourist areas near Walt Disney World and Universal Studios Orlando. A corporate charter transportation services company can help to keep your executives safe, and eliminate their needs to traverse the roads in Orlando. An executive involved in a devastating accident while attending a required corporate event in Orlando can result in major payouts for injuries, property damages and even worse. It’s a much better decision to hire charter transportation in Orlando. Luxury Transportation Group USA is the most widely sought after transportation services company for corporate charter transportation services in Orlando. Not only are the roads in and around the Orlando area dangerous, but they can be pretty confusing to those visiting from out of the area. Of course, the vacationer attractions are always clearly marked with what seems to be a mission signs showing them how to get to the theme parks. On the flip side, some of the venues most widely used for corporate events can be difficult to locate even with a good GPS. Having the executives getting lost on their way to corporate events and meetings isn’t the best idea. Professional charter transportation will reduce the stress involved with attendees trying to locate the venue in Orlando. 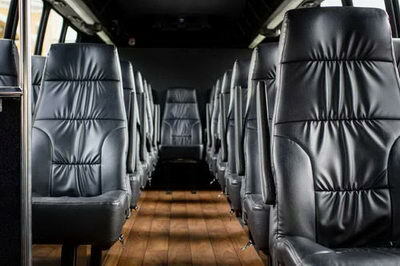 Besides, it’s much more cost effective to book Orlando corporate charter transportation. Luxury Transportation Group USA provides the highest quality charter transportation for executives attending corporate events in Orlando. One of the biggest issues that face event planners is making sure that those who are supposed to attend the corporate events actually do show up and stay for the duration. This can be a big task as Orlando offers so many different things to do that will tempt nearly anybody to skip a required meeting or two. Most people, executives included would rather be having fun on a thrill ride in a theme park, or enjoying some music at a concert in one of the several music venues. This temptation is eliminate when the company hires corporate charter transportation services to transport their executives to the events. Luxury Transportation Group USA offers a complete line of luxury charter transportation for corporate events in Orlando. LTG Orlando provides the ultimate corporate charter transportation services for executives in Orlando. With professional drivers and luxury charter transportation vehicles, companies can rest assured that their executives will be comfortable and safe while getting to and from the venues. Contact Luxury Transportation Group USA for all of your charter transportation services in Orlando.